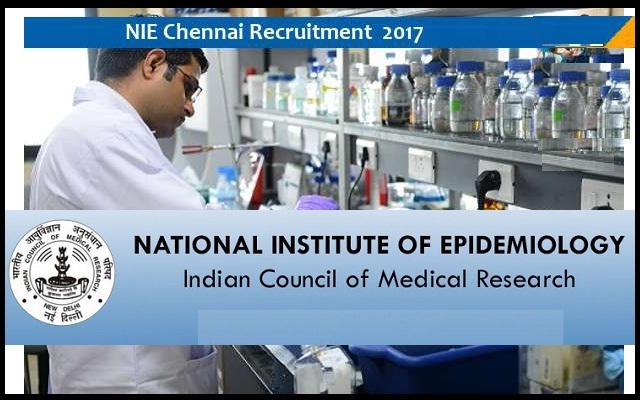 NIE-National Institute of Epidemiology Recruitment 2017-2018 Application Form at www.nie.gov.in, 02 Upper Division Clerk (UDC) Posts. NIE Upper Division Clerk (UDC) Jobs Notification 2017 Released. The last date for submission of applications is 18.12.2017. Interested and Eligible Candidate Can Apply for this Job. NIE Chennai Career Recruitment 2017 Upper Division Clerk - Apply Online. Degree of a recognized University or equivalent. Typing speed of 35 w.p.m. in English on Computer. (35 w.p.m. correspond to 10500 KDPH on an average of 5 key depressions for each word).